During this module we have built on top of this vision, proposing a subdivision and a vision of how we position ourselves within this framework. Within the field of design many directions can be distinguished; interior design, fashion design, industrial design, graphic design, game design, sound design, web design, etc. Most of these directions represent a clear role within a company. The role of industrial design however has become more and more diverse. Where in the nineteenth century industrial designers solely focused on the styling of products, over time this role changed towards a role that Krolopp argues as designers that are ‘problem-solvers’ involved in all facets of research, development, marketing, manufacturing and providing a vision for the company. We have noticed a shift towards a more ‘opportunity-creator’ role in which not only problems are solved but also opportunities for innovation of technology or meaning are created by acting as a creative integrator. 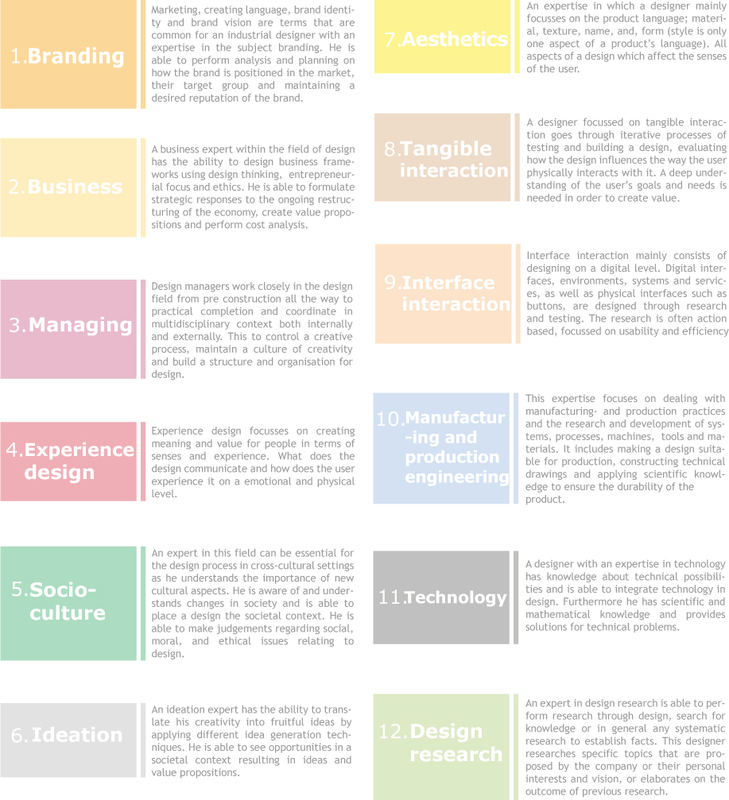 Design educations have adapted to this change, resulting in designers with a wide range of skills. The department of Industrial design at the Eindhoven University of Technology educates their students in a competency-centered learning environment in which identity building, expertise building and community building is stimulated. Students are encouraged to direct their own development and create a vision and identity. This results in a great variety of designers as creative integrators, with their own direction of focus. When more and more companies choose for a deeper integration of industrial design in the NPD the demand for designers as creative integrators will increase. Not all designers are able to work as integrator, yet are companies (especially the ones to which the strategy is new) aware of the fact that they shouldn’t just hire any industrial designer but select them based on their capabilities and expertise as integrator? 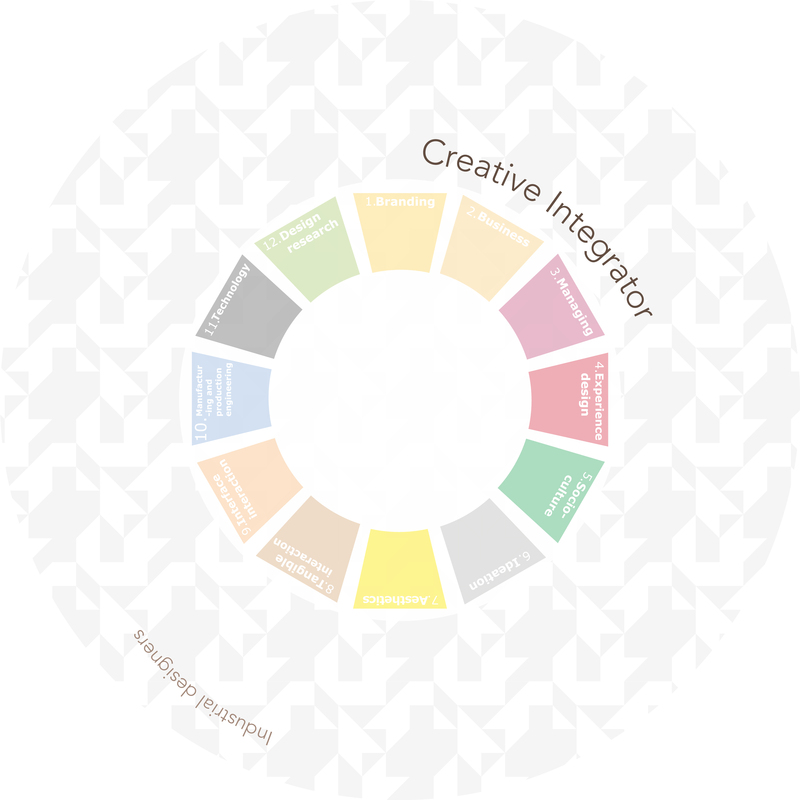 Within the role of creative integrator we identified a range of different expertises which resulted in a subdivision. We believe that besides the skills and capabilities creative integrators have in common, generally their knowledge and skills which distinguish them can be assigned to specific expertises. We stress however that not every integrator has to fit within a specific expertise, a combination is possible as well. Our framework can be seen as a tool to shows companies the different fields of expertise which a designer as creative integrator can have, making them aware of the many other ways a designer can be valuable for a company. This allows a company to analyze and select the expertises they require for the position they offer. Where a company would normally hire a marketeer to deal with branding, knowing that an industrial designers with an expertise in branding could also do these tasks, hiring the designers could be more beneficial for the company. The framework can be of value for the designer by forcing him to think about his expertises, vision and identity, and how he wants to present himself. Using the tool during job interviews can be very useful as it brings clarity in what a company is looking for and the value the designer has to offer. It creates a common language between both parties which can result in a better correspondence between supply and demand on the job market. Above you see the empty framework of circles and segments. The outer circle, filled with a light grey pattern, represents all industrial designers in general. The inner circle, consisting of twelve segments, represents the industrial designer as creative integrator. The segments allow for further differentiation as they represent the different fields of expertises within design. The purpose of the framework is to create a position with a piece of clay, whether this is done by a designer to analyze or communicate his position, or by companies to communicate their needs. Below each expertise is explained. 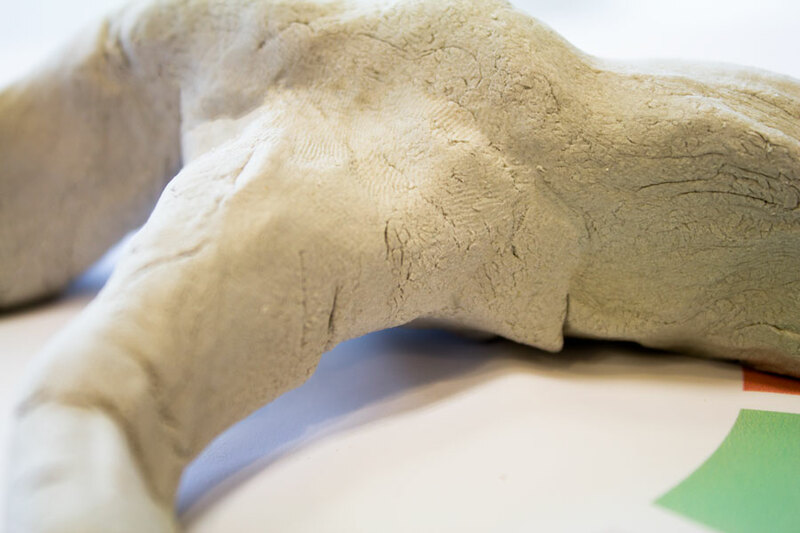 A position in this framework is created by shaping and placing a piece of white clay. 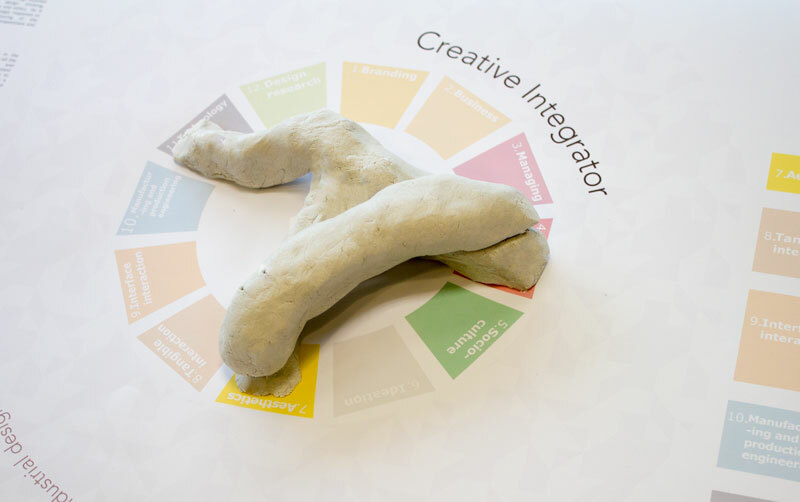 The expertise segment(s) the clay touches represents your expertises as a creative integrator. Within this selection of expertises the height of the clay above a segment represents the level of expertise. Besides a designer’s expertises there is another indispensable aspect which distinguishes one designer from another; his vision and identity. This also needed to be taken into account in the framework as two pieces of clay with the same position and heights still needed to be distinguishable. Since this is such a personal aspect within design, categorizing it or assigning it to specific clay properties was not an option. Instead a designer’s vision and identity is metaphorically reflected in the way the designer treated the clay and the fingerprints that are left behind. Just as in an actual design, where the designer figuratively puts his ‘fingerprint’ on a design with his vision and identity. It is not something a designers has to take into account when positioning his piece of clay. As long as he is aware of this indispensable aspect of a designer. We have used the framework to define our expertises and position ourselves. As we have worked as a team during this module and the process of creating the framework, we combined our pieces of clay into the position of us as a team. Visualizing our position allowed us to better analyze our strategic value. Eef mainly focusses on experience and aesthetics within her design. The most emphasis lies on aesthetics, which she visualized with the height of the clay on the segment. Martijn has a focus on experience design and aesthetics as well but he also has an expertise in technology. His main focus however lies on experience design. The amount of overlap of our individual positions shows a high level of expertise in the fields of experience design and aesthetics when working as a team. Our visions and identities could obviously not literally be read from our clay models but knowing it is represented by the way we treated the clay, our literal and figurative fingerprint, provoked us to talk about it. Designing this framework together also confronted us with our visions and identities. In experience design and aesthetics we both use subtlety as our language. Subtle dynamics and subtle interaction, resulting in a subtle user experience. Subtlety demands precision which we both are able to deliver as we strive for perfection. The accessibility of a design is something we both take into account when designing. Years ago when machines took over the job of the craftsman, it was the designers job to make the product look as if it was made by a craftsman, making it more accessible since craftsmanship was all people knew. With the rapid development of new technologies, extreme innovations could emerge. By making the design of such innovation accessible, people are not scared off by this great change but accept and enjoy it faster. Freedom of interpretation is for both of us an important aspect within design. Giving the user the freedom of implementing it in their daily life or the way they can interact with it. 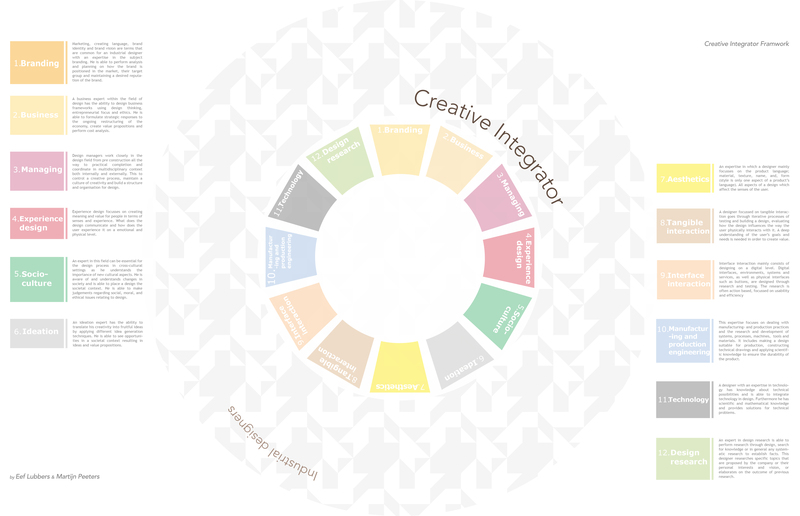 Some of these aspects are visible within the design of the Creative integrator framework. The subtlety as well as the accessibility can be seen in the visual language of the design; the subtle use of colors, subtle representation of vision and identity, and clear structure of circles and segments. We chose for clay as it provides freedom of interpretation. Allowing the designer to translate his position into a tangible object in which he can express himself. During the process of designing the framework much thought has gone into the structure of creative integrator and expertises. Discussion and rephrasing alternated iteratively as well as defining the framework’s visual language, striving for perfection within the given timeframe. A mineral water company was approached by an Asian whiskey company.This because the company’s mineral water had great qualities to preserve the intense and pure whiskey flavour. Since the company would be introduced onto the Asian market as the only water to drink with this specific whiskey, a new glass bottle had to be designed to correspond with the whiskey’s luxurious brand identity and market. The company hired a design agency to design the bottle which resulted in a design that failed greatly. When analyzing this failure it seemed that the design agency did not have any experience or knowledge of glass production, cultural differences or how to adapt to a new market. When hiring a designer, the water company assumed that the design agency, with which they had worked previously, was suitable for the job. Having realized which specific expertises were important for the job and selecting a designer based on this understanding could have prevented this failure. The creative integrator framework could have been very valuable in this case. Krolopp, R. (1994). ‘Design’s link to Technology’. Design management Journal, 6 (2), 36-39. Gemser, G., Leenders. M, (2001). ‘How integrating industrial design in the product development process impacts on company performance’. Journal of Product Innovation Management, 18 (1), 28–38. Perks, H., Cooper, R., Jones, C., (2005). ‘Characterizing the role of Design in New Product Development: An Empirically Derived Taxonomy’. Journal of Product Innovation Management, 22, 111-127. Verganti, R., (2009). ‘Design-driven innovation’. Harvard Business Press. Owen, C.L. (1993). ‘A critical role for design technology’. Design Management Journal, 4 (2), pag.12 . Bohemia, E. (2002). ‘Designer as integrator: realist or rhetoric?’. The design journal, volume 5, issue 2, pag. 27. Dell’Era. C. Verganti, R., (2007) ‘Strategies of innovation and imitation of product languages’, Journal of product innovation management 24, pag. 580-599. Lowgren, Jonas (2013). Interaction Design. “The Encyclopedia of Human-Computer Interaction, 2nd Ed. McAlpine, L. (2006). ‘Cross-cultural instructional design: Using the cultural expert to formatively evaluate process and product’, Native and Northern Education.